‘Urban Living’ is a policy document being introduced by Mayor Marvin Rees. This is a misguided attempt at solving the housing crisis by removing most restraints on tower blocks. 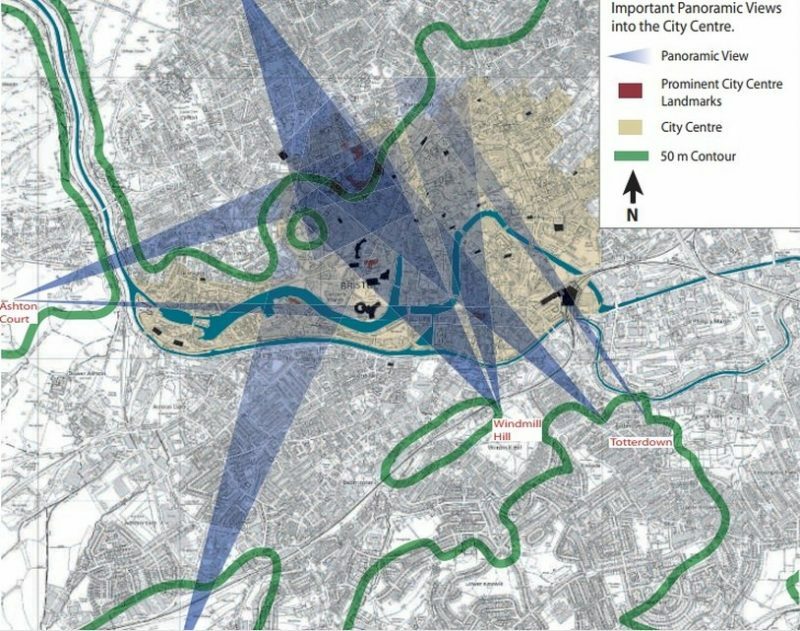 It threatens to transform Bristol from a mid-rise European-style city to a high-rise North American-style city like Houston or Toronto. Councillors should reject it. At the turn of the new century a wave of tall buildings was being built across the UK, specially in London. In the face of this, and with the memory of the social and structural problems that had emerged from the high rises of the 1970s still fresh in people’s minds, opinion in some historic cities became alarmed, and tall buildings policies were developed. 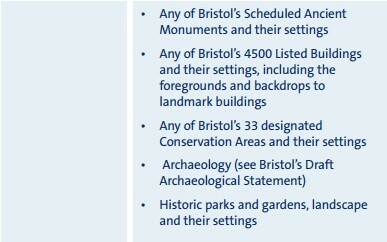 In Bristol, the Supplementary Planning Document No 1 (2005) was produced, followed by the adoption of similar policies in Edinburgh (which have saved Edinburgh’s skyline). SPD1 was designed to discourage tall buildings (though this was not explicitly stated). 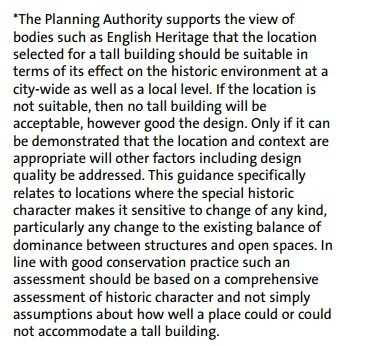 The policy was clearly labelled a tall buildings policy, and was very thorough (68 pages long). An important aspect was reliance on the framework of protecting historic assets, views and conservation areas. 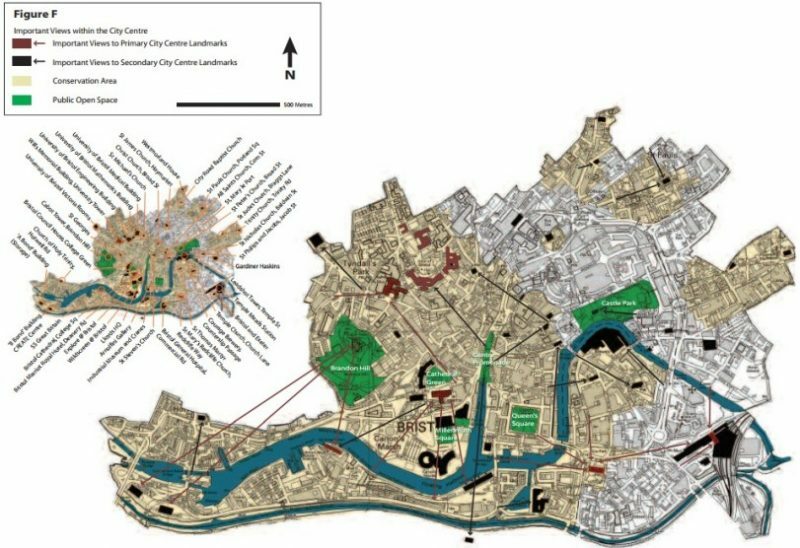 Not only are drawings and textual descriptions given of views that must be protected, but these are extraordinarily extensive, and in several parts of town it is actually suggested that it would be desirable to remove existing tall buildings. Only 3 areas are endorsed as suitable for tall buildings – Broadmead, parts of Old Market, and Temple, and even then endorsement is highly qualified by the desirability of protecting views, and protecting conservation areas. SPD1 judges the historic environment to be highly important. This means that under SPD1, tall buildings were unlikely to be approved in many sites in the city centre, and in many other locations. Which left only three areas of the City centre judged well-suited to tall buildings, and then only so long as views and conservation areas were protected – Broadmead, parts of Old Market, and Temple. 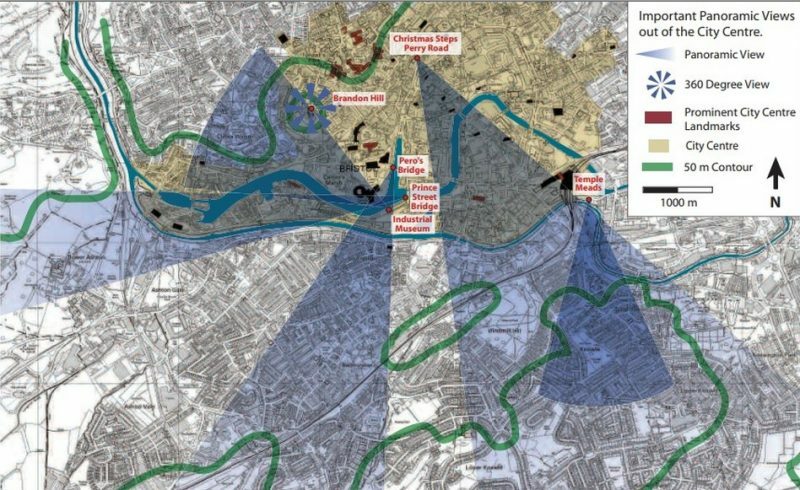 For instance the document expatiates at some length on the need to avoid over-shadowing Temple Meads Station, or Old Market’s conservation areas and historic assets. A map was produced of area where tall buildings might be considered, with blueish areas judged possible – Temple, Broadmead, and parts of Old Market, plus the city centre loop and gateways to the city, plus one iconic building on St Michael’s Hill – but this is subject to many caveats about proximity to historic buildings, conservation areas, and the need for designs for future tall buildings to be of higher quality than existing ones (p19). The most powerful weapon in SPD1’s armoury was probably its sections on the protection of views. It is worth stressing how extensive these are (pp 17-27, 46-51, 56-59, (i.e., 21 pages) and the contrast with short and decidedly ambiguous section on views in the successor document, Urban Living (4 pages). Extensive verbal descriptions were provided of these views, with many grumbles about awfulness of existing tall buildings, and the desirability of removing them. 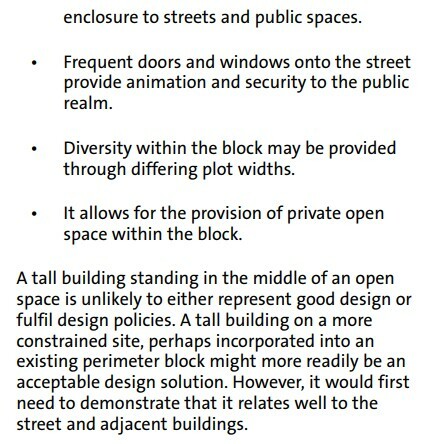 Many other design principles were provided in SPD1 which gave grounds for objecting to tall buildings. 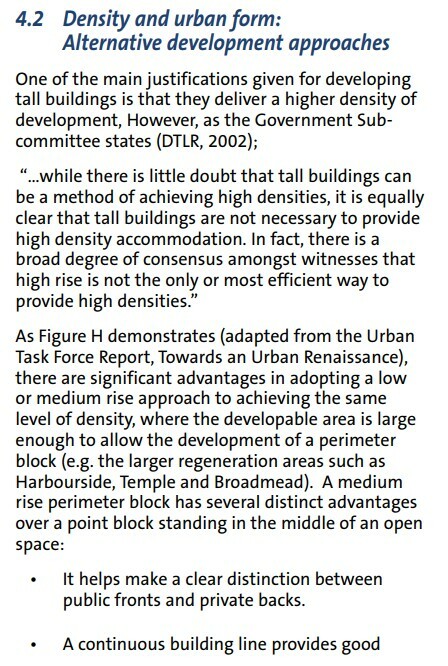 The reader is left in no doubt that tall buildings are disliked and mid-rise is preferred. The whole of SPD1 can best be understood as a determined attempt to stave off tall buildings, carefully providing Officers and Councillors with as many grounds as possible to reject tall buildings. Whether they did so was of course up to them, and recently this has increasingly not been the case. Bristol is now introducing a new policy, after a high profile call by Mayor Marvin Rees in his maiden speech to abandon restraints on tall buildings. 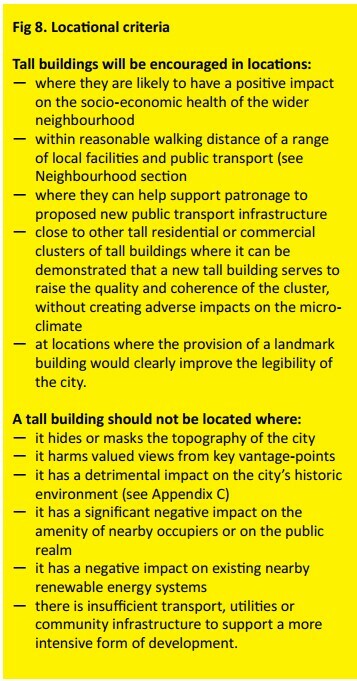 The policy has been through a statutory public consultation process in which 85% of respondents, in the largest response in the city’s history, rejected all the sections on tall buildings. However despite a promise by officers to take the tall buildings sections out of SPD1 (promised at the June 13 Harbourside launch of the results in the absence of city planning head Nicola Beech), the sections on tall buildings have since been strengthened. 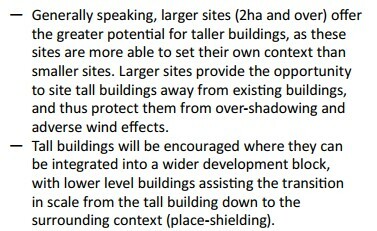 The Urban Living final draft encourages tall buildings, and assumes that they will be widely built, with the result that a very much smaller proportion of the (anyway much-reduced as compared to SPD1) tall buildings discussion is devoted to providing grounds for objection. The document’s title (“Urban Living”) does not mention tall buildings, and it devotes to them only 11 pages (versus SPD1’s 68), burying them within other material. This treatment is obviously deliberate. The earlier sections of Urban Living contain so many laudable passages on design, people-friendly streets, outdoor spaces, sizing of homes, etc that the thoughtful and positive tone may lull the unwary reader into believing that little has changed. On the contrary, everything has changed. It is now much harder for Councillors to find policy grounds on which to base rejection of an application for a tall building – and much easier for developers’ consultants to argue that their building is policy-consistent. It would be a dim developers’ consultant who could not use the Urban Living policy grounds to support almost any tall building application, given that tall buildings are now encouraged in virtually any location in the city. Unsurprisingly, there has been a dramatic recent increase in tall buildings proposals and applications, given the status of Urban Living as ’emerging policy’ to which councillors should pay attention. Two 20- and 22-storey residential towers on Bedminster Green. Various developments on the north side of Castle Park (Wine Street), with rumoured heights of 14-18 storeys. Possible high-rise city, Chinese investors willing, in the Cumberland Basin. Tall buildings will be encouraged where…. The word “encourage” was never once used in relation to tall buildings in SPD1, except disapprovingly about Birmingham (p4). 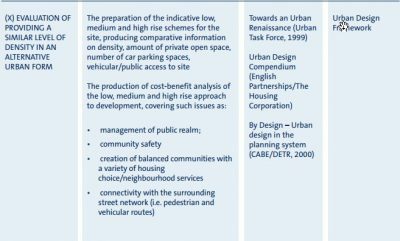 In Urban Living tall buildings are “encouraged” in a critical set of paragraphs (pp 50-51) which carry most of the weight of Urban Living’s policy guidance on tall buildings: effectively such guidance has been shrunk from 68 pages in SPD1, to a few brief paragraphs in Urban Living. 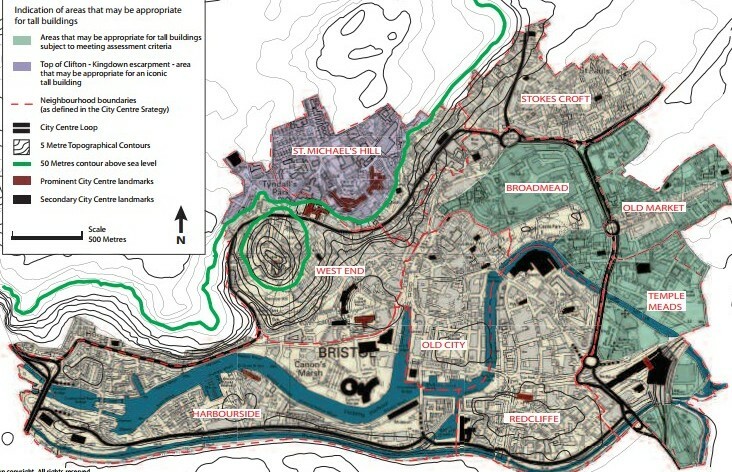 A map is provided (p23). Its meaning is obscure as no ward boundaries are indicated, but we are told that hyper-density (not defined) is possible in St Philips, Avonmouth, Hengrove Park, land released through the Green Belt, Hick’s Gate, Filton, and some former PIWA sites and there is ‘significant potential for intensification’ in Bedminster Green, Temple Quarter, City Centre, and some former PIWA sites. Presumably all are judged high-riseable, given that Bedminster is within them and the city is pushing hard for high rises in the midst of Bedminster’s quiet Victorian suburbs. A development like Little Paradise in Bedminster would easily pass on these criteria; it is massive, has lots of lower level buildings in addition to the towers, is near to public transport, within reasonable distance of a range of local facilities, and arguably would create landmarks (what tall building wouldn’t?) and improve the legibility of the city (again, what wouldn’t?). The Appendix C referred to (pp 66-67) does not, in fact, provide ‘further guidance’ but is simply a list of landmarks, without any indication of what use is to be made of them. Should one site tall buildings bang in front of them? Or away from them? 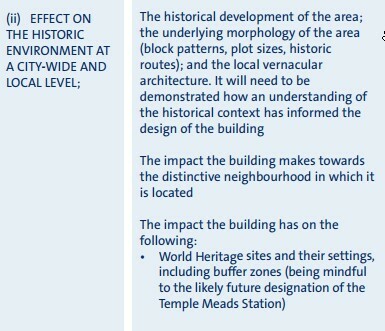 Urban Living gives little indication, though in the paragraph ‘Fig 8: Locational criteria’ there is the phrase that “A tall building should not be located where: – it has a detrimental impact on the city’s historic environment (see Appendix C)”. Detrimental means what? 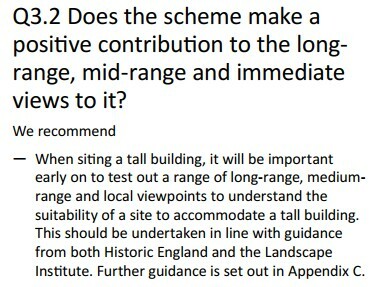 The reader may want to contrast this cursory treatment of views and the historic environment with the many pages devoted to the subject in SPD1, which make it absolutely clear that tall buildings should not be sited in view-lines, which are explicitly set out, with the proviso that even those are not exhaustive. Alas, in Urban Living these very few ambiguous statement are all there is, in terms of the provision of location and view-based criteria, for objecting to tall buildings. There are other grounds for objection, such as insufficient schools and transport, but these are not enough. High rises are usually seen as ‘merely’ an aesthetic issue. They are not. The case against high rises is strongly evidence-based, backed by the world’s leading urbanists such as Jan Gehl and the late Peter Hall. The case is based on both financial and health considerations. It also involves the city’s attractiveness, which impacts its tourist revenue and its capacity to attract high quality talent. For these reasons across Europe, rich historic cities have taken great care to preserve their classic profiles. If high rises are Marvin’s answer to the affordable housing problem, we are in trouble. A substantial body of research tells us of increased mental health issues for mothers with young kids and a general increase in residents’ social isolation, and rates of depression. It’s worth asking the architects and developers of high rise how many of them choose to live in one. Unsurprisingly – very few. These buildings are also considerably more expensive than mid-rise, so do not solve the problem of housing affordability. They introduce a new ‘demand-class’, investors, often foreign investors, attracted by the defensibility of high rise apartments with concierges when their owners are absent. These are not the people we should be targeting. These buildings will alter the feel of Bristol as a whole. 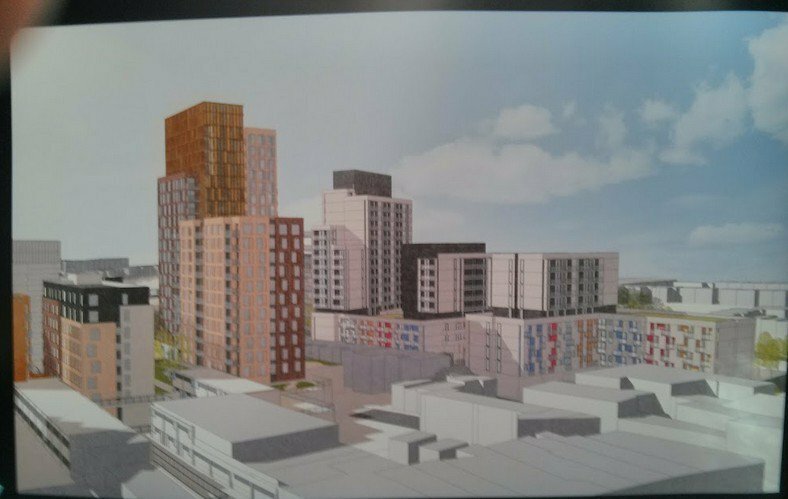 Massive, overshadowing blocks will dwarf the beauty of our historic city to the detriment of an entire generation of Bristolians – and of our economic prospects. Until September 25 Urban Living is still in final consultation so could conceivably be improved. But it cannot be substantially altered without being re-consulted on, and that will not happen. Meanwhile it is important to submit your views. When it emerges in final form, presumably little changed, Urban Living should be called-in and rejected by Councillors, to encourage the adoption of a more moderate draft which better secures the city’s growth, more affordably, more healthily, without damaging this historic city’s USP by overwhelming it with tower blocks. Comment on Mayor Marvin Rees’ decision to trash Bristol by covering it with tower blocks – and other topics.